This FAQ is available in PDF Format! Click here to download! What HD and Digital channels can I get in my area if I purchase an OTA antenna? With a television antenna you can get the local free broadcasts that are available in your nearest city if you are close enough to the stations, and the conditions are right. The stations very from city to city and mainly consist of NBC, CBS, ABC, FOX, ION, and PBS. To get a better idea of what channels may be available in your area you can go to TVfool.com, and provide them with your zip code and view your local area broadcast towers. Can I purchase a TV antenna and install it in my attic, or window? Attic and window installations are sometimes a viable option, however can lead to many signal issues. Majority of the time and outdoor installation is recommended. With an attic installation you risk losing anywhere from 20-40 percent signal strength based on the design and construction of your home. With a window installation, if the window faces the direction of the stations, you may have good results. However, if the window is on the opposite side of the stations, results could be bad. Plus with a window installation on a first floor, results may vary because a TV signal is usually better up high, than it is at ground level. Typically we recommend only choosing any type of indoor installation if it is your only option. A general rule of thumb also is that if the stations are 30 miles or more away from you, an indoor installation may have many issues. Any additional information or tips you can give me before I purchase my new HDTV Antenna? A couple of the things that we notice most people forget about when purchasing an antenna are in regards to their own existing products that they are trying to use. For example, if your television is old, it may need a converter box to work with a digital antenna. To be more specific, your television needs what is called an ATSC Tuner card to be able to be used with an antenna without a converter box. Another good example is with your existing cable already wired in your home. OTA antennas use the same type of RG6 coaxial cable that satellite and cable companies use so many times customers buy an antenna with the impression that they will be able to just hook into their existing cabling and they are good to go. Often times this is true, however it may not always be this easy. If your cables or splitters are old, or you are trying to hook the antenna up to multiple televisions, signal issues may occur. A pre-amplifier is a product that is purchased to make up for those signal issues. However a pre-amplifier needs to be installed in a specific way to be utilized properly and your existing set-up has to accommodate for that. Give us a call at 877-312-4547 if you have any questions about your installation set-up. I saw an antenna on your website that states it can get channels 100 miles away, and I was wondering if this is true because I have a couple cities about that far from me. Most manufacturers are accurate in regards to the ranges of what their antennas can do. However, 100 miles is most likely out of the question and this is why; Digital signals are broken up into VHF and UHF frequencies. UHF frequencies can travel at most about 70 miles due to the design of their wavelength, and VHF about 100 miles. With that said, the other part of the equation that factors in is how powerful the TV station is broadcasting their signal. Due to many guidelines they have to follow, many times they are broadcasting the signal at a fairly week wattage. So since their signal broadcast is week, it is not going to travel as far. This is especially true for VHF frequencies because VHF stations broadcast a very week signal almost all the time. So no matter what range your antenna says it may be able to do, if the signal coming from the television station does not travel far enough to make it to your house, there is nothing any antenna would be able to do to get that station. How come there are some channels that I can no longer get since the digital transition switch? Unfortunately there a few different things that may have caused you to lose stations during the digital transition. The main problem though is that the signals are broadcasting from the television stations at a weaker signal then they used to, so the digital signal does not travel as far. Also because of the weak signal broadcasts, you may need to add an amplifier to your existing set-up to improve the signal. Another reason you may be missing channels is because perhaps the broadcast station changed their frequency and your antenna may not have a good design for that frequency. Also, in some cases, the broadcast stations change their tower locations and their tower may no longer be in the direction your antenna is pointed. If you go to TVfool.com you can use that website to find out about your local stations specifications and location. OTA stands for “Over The Air” television. OTA television is free in the United States and Canada and can be received with the appropriate TV antenna if you live close enough to the broadcast stations. If I purchase an OTA antenna will I get channels from multiple cities? The answer to this question solely varies on your geographical location. If the proper antenna and/or rotator are purchased, you may be able to receive channels from cities anywhere from 60-70 miles away. In rare cases, even 100 miles away. Will my TV get the new digital signals? The answer to this question depends on how old your television is. For example, if your television is old, it may need a converter box to work with a digital antenna. To be more specific, your television needs what is called an ATSC Tuner card to be able to be used with an antenna without a converter box to pick up digital OTA signals. Where can I find an installer in my area for my new HD digital OTA antenna? Unfortunately professional installers solely dedicated to doing OTA installations are hard to come by now days. You can check your local yellow pages, or search on the internet. Sometimes local TV stores and repair shops do installations on the side also. Most antenna installations though are more of a due it yourself project. This is why you have Solid Signal to help guide you through the process! Why do you still sell those antennas that look like the one on my grandfather’s house back in the day? Aren’t those obsolete now with the digital transition? Actually those antennas are still the best design out there. 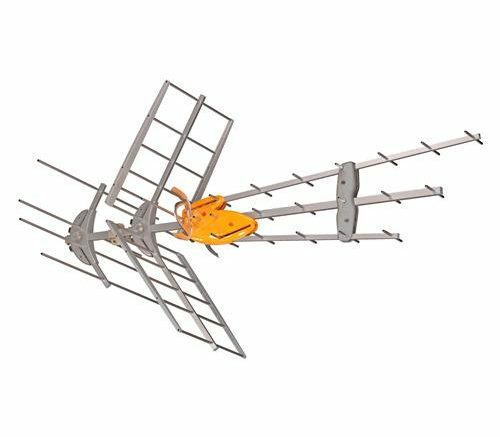 They call them a “Yagi Design”, and they have great range and are usually designed to be able to pick up all the different frequencies TV stations use for their digital signals. Even though the signals are digital now, they are still broadcasted in the air with RF frequencies just like when the signal was analog, which is why the antenna is still able to work properly. Besides the HD antenna, what else do I need to purchase? Everybody’s scenario and set up is going to be different; however there are a couple general rules of thumb that will help you to know. Besides the antenna you need something to mount it on. You need coaxial cable to go from the antenna to your televisions. If you are trying to hook your antenna to multiple televisions you should get an amplifier. If your television is older and does not have an ATSC tuner card, you will need a digital OTA convert box. Finally, if the local broadcasts available to you are in different directions you may need to purchase a rotator. How come I cannot get the same stations with my new OTA antenna that I was able to get with my old satellite/cable provider? An OTA antenna allows you to receive free local broadcasts that are being aired from your nearest cities. The stations that broadcast to the public for free are very limited in comparison to channels provided from a satellite/cable company that charges monthly payments. These stations are usually limited to the popular local broadcasting stations such as ABC, NBC, CBS, FOX, PBS, and ION. When I use my new OTA antenna, will I have an on screen guide so I can see what shows are on? It depends on the type of ATSC tuner card that is built into your television or converter boxes. If your ATSC tuner card incorporates what is known as a PSIP Digital Standard (Program and System Information Protocol), then yes you will have a digital on screen guide for your programming. You will need to look in the manual of your television or converter box to find out if it has PSIP capabilities. My antenna was working the other day and now it is not, what happened? Unfortunately there are over a dozen different things that can cause your OTA antenna to stop working. Let’s focus on the more common issues to troubleshoot first. If there is any type of amplifier in your set up, first find the power supply to it and make sure it is plugged in and the outlet is in working order. If it is plugged in make sure the indicator light (if it has one) is lit up. Next, unplug the power supply, plug it back in and then go to your television and run a full digital channel scan. If that does not work, then you need to walk through your existing set-up to check for damaged parts. Check and/or replace damaged or old cables, splitters, transformers, and amplifiers. Also check the antenna to make sure it has no physical damage to it, and that it has not been turned towards a different direction. After you troubleshoot, or make any changes always run a full digital channel scan on your television to see if that fixes your issue. Can I purchase my OTA antenna products locally? Unfortunately now days there are not many retailers locally selling OTA products because the demand for them is not high enough. Some large stores like Best Buy and Costco sell antennas, but their options are very limited along with their support and knowledge of OTA products. Most OTA products are purchased online from retailers such as us that have many years of experience with the products and can offer full 24 hour tech support and customer service. The antenna you recommended is very large, is it really necessary to purchase an antenna of that size? Unfortunately if we recommended a large antenna, it probably is necessary. A general rule of thumb is that the larger the antenna, and the more elements on it the better it will do for stations very far away. The reason for this is because a big antenna with many elements on it will have a much better dB gain for each frequency than a small one will. I am unfamiliar with all the different terminology used to explain the types of OTA antennas and was hoping you could explain them to me? AM: A type of frequency used for radio stations. Some OTA TV antennas can also pull in AM signals. Amplifier (Booster): An amplifier is a device used in conjunction with an OTA antenna designed to help make up for signal loss due to long runs of cable or splitters. Bow-Tie: This is a design of antenna typically used for UHF only antennas and is named that because the front of the antenna usually has elements that look like a bow-tie. Typically these antennas are square, or rectangular in shape, and have a metal mesh screen on the back of them. Channels 2-6: Not to be mistaken with the channel number on your television, this actually refers to the RF frequency that is used for the Low band VHF frequencies. The RF channel frequency and the actual channel on your television will often be different from one another. Channels 7-13: Not to be mistaken with the channel number on your television, this actually refers to the RF frequency that is used for the High band VHF frequencies. The RF channel frequency and the actual channel on your television will often be different from one another. Channels 14-69: Not to be mistaken with the channel number on your television, this actually refers to the RF frequency that is used for the UHF frequencies. The RF channel frequency and the actual channel on your television will often be different from one another. Coaxial Cable: This is the type of cable used to connect an OTA antenna to your television. This is the same type of cable that satellite and cable companies use. The most popular type used is called RG6 coaxial cable. Deep Fringe: A term used to describe an antenna that has the ability to pull in OTA stations that are very far away. Directional: A term used to describe an antenna that is designed for picking up stations in the direction it is pointed at only. These types of antennas usually do not have much more than a 30-50 degree range on a compass. FM: A type of frequency used for radio stations. Some OTA TV antennas can also pull in FM signals. High VHF: A category of VHF frequencies that is in regards to RF channels 7-13. Low VHF: A category of VHF frequencies that is in regards to RF channels 2-6. Multi-directional: A term used to describe an antenna that is designed to be able to pick up channels from the direction it is pointed at, and it also has a range of about 50-90 degrees on a compass. Omni-directional: a term used to describe an antenna that is designed to be able to pick up stations from any direction at the same time without having to rotate it. OTA: Stands for “Over the Air”, which is used in reference to antennas that receive RF signals that broadcast in the air. Rotator/Rotor: A device used to rotate an antenna in different directions. If your local broadcasts come from different directions a rotator is recommended. Splitter: A device used to split your signal from your antenna off to multiple televisions. If you plan on splitting your antenna to multiple televisions you should also purchase an amplifier to make up for signal loss. UHF: Stands for “Ultra High Frequency”. In TV antenna terms it represents the RF frequencies used from 14-69. UHF/VHF: This is used to represent that the antenna can receive both UHF and VHF frequencies. VHF: Stands for “Very High Frequency”. In TV antenna terms it represents the RF Frequencies used from 2-13.